Kariss meets Dr. Amy Garrett, who survived a brutal childhood attack in which the assailant was never found. Now Dr. Garrett wants her story written in a novel. Kariss wishes she could seek the advice of Special Agent Tigo Harris, but she broke off the relationship a few months prior and seeing him again would be too painful. She interviews Amy and conducts her own research, stepping unaware into a viper’s pit of danger. Tigo misses Kariss and wants her back, but he understands why she broke off their relationship. Instead, he concentrates on solving a car bombing and bringing the killer to justice. As Kariss’s new story attracts an onslaught of danger that she never expected, can Tigo save the woman he loves and find who wants her dead for writing about an unsolved cold-case? 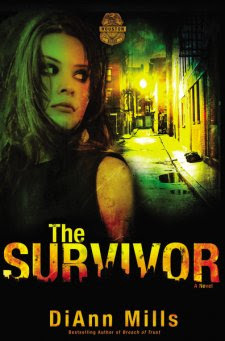 The Survivor is a heartening suspense novel that will draw readers in with a quick snap. Those two qualities may surprise you at how well they work together, but DiAnn Mills perfectly meshes a hopeful romance with a daring mystery. Kariss Walker, a best-selling mystery author, is approached by a survivor from a brutal attack from years ago who wants Kariss to write her story. Amy is a psychologist who counsels abused women while battling the fears of her unresolved case. She thinks Kariss is the key to successfully getting her story out there for abused women to find encouragement. When the story idea goes public, Kariss is victimized, once again. Tigo Harris, an FBI agent working on a case involving a family torn apart by a car bombing, jumps to Kariss's rescue. Especially when Amy's attacker begins stepping out of the shadows. Mills keeps readers engrossed with the many plot lines, even at times when it seems like none of them add up. The tentative relationship between Tigo and Kariss is the sweet distraction readers will look forward to when it seems the special agents and Houston police forces get no closer to finding the violent culprit. Even when Kariss's life gets more dangerous than ever it's simply impossible to actually lose all hope for her future. Mills somehow mixes in so much encouragement and very faith-conscious characters who know how to add a few words here and there to keep readers uplifted. The Survivor will no doubt draw back fans of the Crime Scene: Houston series and attract new ones!